They Might be Tiny, but They Don't Need to be in a Purse!. They Might be Tiny, but They Don't Need to be in a Purse! Owning a toy breed dog should include time allowing them to "be a dog." Toy dogs are extremely popular, but I'm not always sure they get their due attention in the training world. I think it is taken for granted that they don't cause much trouble, or at least they are so small you can just pick them up to remove them from any problem situation. It is a bit of a disservice to the dog though, at least in my opinion. After all, there are many breeds of toy dogs that provided a distinctive service to our past history. Numerous toy breeds were wired to be tough and tenacious little hunters, and somehow we've lost sight of that reality. I don't have a problem with people wanting to dress these little ones up or toting them around in purses as long as they still honor the dogs for what they are meant to be. That means letting them go to ground from time to time, play in the dirt, explore the terrain and fulfill the drives they were born with. Owning a toy breed dog should include allowing them to "be a dog" with equal or more time as it includes treating them as surrogate children. It starts with the simple task of teaching them they can walk on a leash. Once the dog can walk on a leash, we can start exploring. Eventually working toward off leash reliability so that the tiny dynamos can really get out and have some fun. On one of my visits to Gun Dog Supply I had the pleasure to meet Molly, a cool little Yorkie that gets to go with her owner to work and hang in the office. She knew a fair amount of stuff already when I first met her, but hadn't been on a leash a lot, so it was fun to get her started. 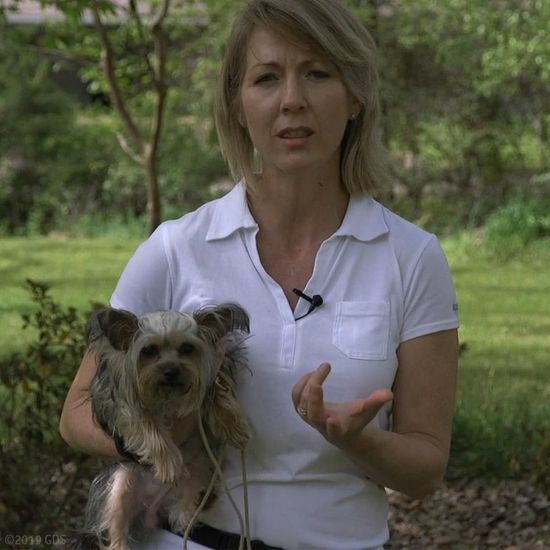 You will see in the video a typical response to leash pressure. If a dog is not trained how to respond to it, they freeze up. I had to use a bit of encouragement, but got her moving with me in a few minutes. These techniques are basically the same regardless of the breed of dog. The difference with these tiny guys is you really have to get down to their level. We probably appear to be GIANTS from their perspective, so it really helps to bend and get closer to their line of sight. I hope to cover more topics in the future with these toy breeds. They can do so much more than we often give them credit for. We just have to stop underestimating them and start training! Robin MacFarlane is a professional dog trainer and owner of That’s My Dog in Dubuque, Iowa. Her best-selling dog training DVDs, JUST RIGHT and JUST RIGHT 2 have helped thousands of dog owners teach their dogs basic obedience and fix problem behaviors through a system of training that you can easily work into your daily routine. Does Your Dog Know Her Place? How Long Does My Dog have to Wear the E-Collar? Dogs and Doorbells -- Oh My! Stop Your Dog from Bolting to the Door! Teaching Your Puppy to "Kennel Up"
Want a Standing Ovation? Teach Your Dog to "Take A Bow!" Want Your Dog to Come to You? Try Moving Away from Him. Before You Expect a Dog to Stay on a Place, Teach Him to get on Willingly. Impulse Control Games are a Time Well Spent Playing with your Dog! Juggling All Your Training Equipment? 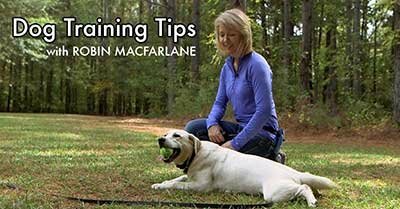 How to Strengthen Your Dog's Understanding of "Stay"
E-Collar, Leash, Treats, Toy, and the Dog. How to Manage it All! Is Your Dog Collar Wise? "How long does my dog have to wear the collar?" I Need a Shock Collar! Why Would I Want to Use an E-Collar on My Dog? Are Remote Collars Punishment, Negative Reinforcement, or Motivators? Tennis Ball, Tug or Cookie? What do Rewards Have to do with Good Training? The More Important Tool: Part 4 of "It Is More Than Just Pushing a Button." Do You Need Impeccable Timing in Order to Use a Remote Collar? What Does Your Dog's Future Look Like? How Long Does It Take to Train My Dog? Put a Plan Into Motion for Dealing With Your Dog's Behavior Problems! Why are You Grateful for Your Dog? Are You Struggling to Get Your Dog to Stay? Try This. There are Only 3 Levels on a Remote Training Collar? So Your Dog Knows Sit. Now What? Know How to Train a Dog, Know How to Use a Remote Collar? "But my dog doesn't like it." Proofing: How to Help Your Dog Really "Get It." Good Health: The Missing Link for a Happy and Well-Adjusted Dog? Are You the Center of Your Dog's World? What Behavior are You Rewarding the Most? When is the Right Time to Start Training My Dog? Is it Important that a Dog Learn to Heel? Pull-Quote= Owning a toy breed dog should include time allowing them to "be a dog."